In association with Concerts SA, iSupport Music Business presents a performance of Solomon Willy at Seaman’s Corner in Hammarsdale on October 1. 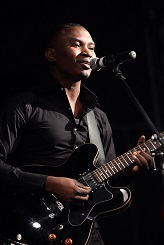 Solomon Willy is a performing artist, guitarist, composer and a music producer and now Durban-based musician. Born in the City of Warri in Nigeria, he was first exposed to music in his early age as a member of children’s church choir. He later learnt to play drums and keyboards, and in his secondary school days he developed more interest on the lead guitar, studying the instrument at a local music school. He formed his band in 2009 and his music career took centre stage when he was selected in a talent search audition at the Durban SABC to perform at the 2010 Fifa World Cup Fan Festival Stages in Durban. Judges Neil Comfort and Malcolm Nhleko said they were blown away by his performance and gave him more platform as a new talent. He also received an Award from the Department of Arts and Culture KwaZulu-Natal Eastern Region for band search 2011 at the Pavilion, Durban. He has performed throughout Nigeria and South Africa, and Australia with Keychange Music Project; he performed in nine cities in Australia in 2009 as a lead guitarist in a band backing a tour by a South African Zulu Choir. He is planning a debut single, followed by an album, later in the year. Willy and his band are extremely versatile and professional to the core, with vast experience from playing at various corporate functions and jazz festivals. The band offers original compositions and extensive mix of popular tasteful African music and jazz standards hits. Some of the most exciting moments of his career were performing at the Durban Jazz Festivals, UGU Jazz Festivals, 2010 World Cup Celebration and many others. Solomon Willy Profile has been published on several South African magazines and newspapers on numerous occasions. Endorsed by Parker Guitars South Africa and JVB Strings Australia. He is a member of SAMRO, KUMISA and also a session guitarist for African Sinakho Disability Theatre, Unlockedkeys, Soul Trill and Jazz Connections. The band features Solomon Willy on guitar, Siphesihle Mngwengwe on keys, Sbu Zondi on drums and Ntuthuko Hlongwa on bass. The performance takes place at 18h00 at Seaman’s Corner, C568 Dimba Road, Unit 3 in Hammarsdale. Tickets R30 at the door.